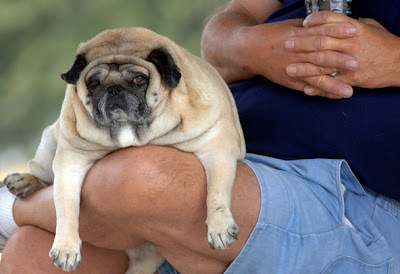 Over 50% of pets in the United States are overweight. Just like people, obesity can lead to other health concerns, such as diabetes, heart disease and arthritis. Obesity can even shorten your beloved pet’s lifespan. A lifetime study of Labrador Retrievers showed that even moderate obesity can reduce the pet’s life expectancy by two years. But, how do you know if your pet is overweight? A pet’s body score is rated on a scale of 1 to 9, with 5 being ideal for most breeds. The best way to determine if your dog is overweight is to stand over them. You should be able to feel their ribs easily, without being able to see them (except in the case of certain breeds, like greyhounds and whippets). 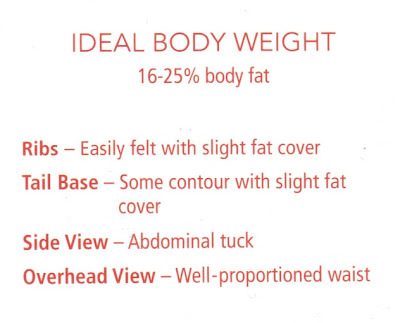 They should also have a nice taper at their waistline, with an hourglass figure. If your pet is oval or egg shaped, they are likely overweight. Just like people, keeping your pet at an appropriate weight can lead to a longer and healthier life. If you are concerned about your pet’s weight, make sure to bring them into Kingsbrook Animal Hospital in Frederick, MD to see your veterinarian, who will help you develop a weight loss plan so you can spend more time with your happy, healthy pet. This entry was posted in Obesity and tagged Frederick MD, Kingsbrook Animal Hospital, obesity, obesity awareness, Veterinarian, weight loss on May 19, 2015 by yourfriends. “Seeing animals suffering from health conditions secondary to their obesity is a common situation,” said Dr. Louise Murray, vice president of the Bergh Memorial Animal Hospital, run by the American Society for the Prevention of Cruelty to Animals, in New York. Just as diabetes and heart disease are more common in people who are obese, these diseases also are more common in overweight animals. The average cost of veterinary care for a diabetic dog or cat in 2011 was more than $900, according to Petplan USA, a pet insurance company. Treatment for arthritis and cruciate ligament tears, which can be caused by the strain of an overweight frame that weakens joints, especially in dogs, cost pet owners an average of $2,000. In 2011 alone, pet insurance claims for diabetes increased by 253 percent, according to Petplan. Claims for heart disease rose by 32 percent, while claims for arthritis soared by 348 percent. 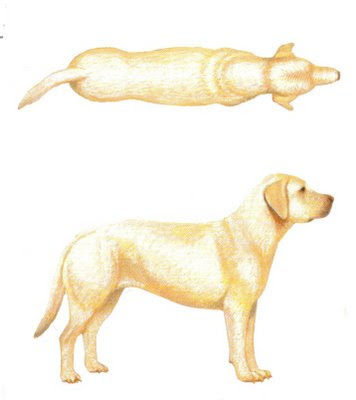 Some of the most popular breeds – golden retrievers, German shepherds, Yorkshire terriers – are susceptible to orthopedic problems for genetic reasons, but these problems occur earlier and more severely with pets that are overweight, said Dr. Jules Benson, vice president of veterinary services at Petplan. Dr. Benson said it is not uncommon to see dogs that are rendered practically immobile by a combination of weight and joint or bone issues. “The most heartbreaking thing is having to put a pet to sleep just because it can’t mechanically get around anymore,” he said. “They’re otherwise alert and healthy, but their quality of life becomes so low that you have no choice but to put them to sleep.” Many people find their chubby cats and dogs amusing. But where pet owners see humor in a hefty ball of fur, veterinarians like Dr. Murray of the A.S.P.C.A. see problems that can cause suffering and a shortened life span. “People may have a sense that their pet is overweight but won’t always realize the consequences,” she said. “An owner might say about their cat, ‘I don’t understand why Fluffy’s coat looks so terrible, why she has these mats over her back and has this smell,’ and I have to point out to them that she’s too overweight to groom herself.” The problem in pets mirrors that in overweight humans, often stemming from lack of exercise and too many snacks and calorie-dense foods – or, in this case, treats and table scraps – between meals. For veterinarians, broaching the subject of an overweight cat or dog with owners can be a delicate task. Some respond defensively or see it as a reflection of their lack of exercise and struggles with the scale. Bringing it up with an owner requires just as much finesse as pointing out someone’s own weight gain. “It can be a sensitive issue,” Dr. Murray said. “People feel defensive, as though they’ve done something wrong – that their pet is suffering discomfort because of something they did. It’s not something where you can just leap in and be blunt. You have to be very delicate.” But getting a portly pet back into shape can carry risks of its own. Hammering the pavement with an overweight lab or boxer that also happens to be arthritic can worsen the condition and cause cruciate ligament tears, akin to an A.C.L. injury in humans, which can happen all too easily in dogs, said Dr. Carol McConnell, chief veterinary medical officer for VPI Pet Insurance. This entry was posted in Obesity, Pet Obesity on December 12, 2012 by yourfriends. A veterinary charity in Britain is holding a 100-day fitness contest for eight of the country’s plumpest pets. 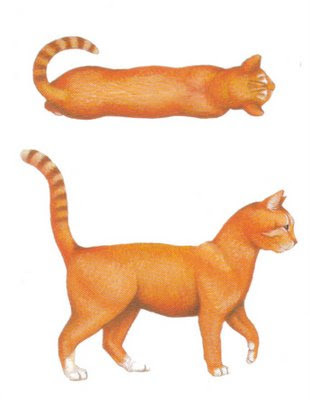 Whichever animal achieves the biggest percentage weight loss and best sticks to its regimen will be the winner. 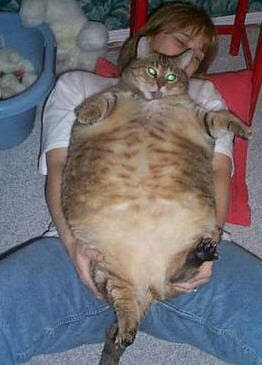 Above, a veterinary nurse holds Tinks, a contender who tips the scales at 21 pounds. The seven dogs and one cat, selected by the veterinary charity PDSA, are all more than 30 percent overweight and weigh a combined total of 421 pounds. The animals, which will be put on individual exercise programs, need to shed a total of 163 pounds to reach their ideal weight. This entry was posted in Obesity, Weight-loss on December 1, 2008 by yourfriends.